It’s well documented that if you want to build a successful e-commerce business, then a recurring revenue model is the way forward. Selling WooCommerce subscription products can be much more profitable than charging for each purchase as a one-off. After all, your marketing costs are the same whether the customer makes a one-off purchase or a regular subscription. But with an ongoing subscription, that same customer is paying you every week, month or year – for no extra customer acquisition or marketing costs. WooCommerce Subscriptions is the official extension for taking recurring payments in your WooCommerce store. It provides an easy way to create products and sell them on a daily, weekly, monthly or annual basis. It comes with all the subscription-based features you’ll ever need, such as the option to add a free trial period and one-off sign-up fees on top of the regular subscription payment. Your customers will be billed automatically for their regular subscription fees using your chosen payment method – whether this is PayPal, Stripe, or another gateway. See the two plugins in action on our subscriptions demo site! I’m going to tell you more about the benefits of using WooCommerce Product Table and Quick View to list subscription products. I’ll also explain exactly how the two plugins work together and where to get them. I think that WooCommerce Subscriptions is a fantastic WP plugin. We’ve used it on lots of our clients’ websites and helped them to build recurring revenue for their business. However, it does have one major problem. The Subscriptions recurring payments plugin just lists subscription products in the same layout as any other WC product. The only difference is that the ‘Add to Cart’ button is replaced with some other text. Customers have to click through to the single product page to see information such as the product description and other useful data. That’s fine for some types of subscription, but others will sell better with a different type of layout. For example, what if you want customers to be able to view your subscription products alongside one another and make comparisons? Well, that’s not possible with the default layouts because you have to click through to the single product page for full details. What if you want customers to subscribe without having to visit a separate page for each product? WooCommerce Product Table lists each subscription product on a separate row in the table layout. Customers can easily view the subscription cost, make comparisons, and add to the cart without having to click elsewhere. It’s an ideal way to increase the recurring revenue from your WooCommerce Store. Display add to cart buttons directly in the subscription product list. Customers can choose a quantity and buy directly from the product table view. You can choose your columns to show extra data about each subscription directly in the table. This means that customers can choose a subscription without having to click elsewhere. Add filter dropdown lists above the table or filter widgets in the sidebar. This lets customers quickly find a subscription product based on category, tag, attribute, and other data. The easy way to sell subscriptions from a table layout. Alternatively, you can sell subscriptions outside of the single product page by adding the WooCommerce Quick View Pro plugin. This adds quick view buttons for each product. Customers can use these to view extra information in a lightbox window. They use the lightbox to choose variations and add subscriptions to the cart, without having to visit a separate page. Sell subscriptions from a user-friendly quick view lightbox. Can I use solutions 1 and 2 together? WooCommerce Subscriptions and WooCommerce Product Table work together automatically. You don’t have to do any extra setup to use them together. Simply install the WooCommerce Subscriptions plugin and set up your subscription products. This is really easy – just choose ‘Simple subscription’ from the dropdown in the ‘Product data’ section when you create a product. You can then choose your subscription amount, frequency and add a free trial period and setup free if required. 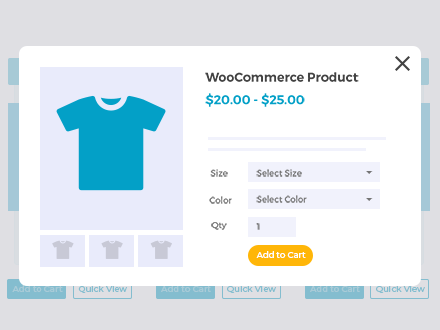 Once you’ve done that, install WooCommerce Product Table and follow the instructions to create your first product table. Make sure you include a ‘Price’ and ‘Add to Cart’ column in the product table. This is where the subscription product information will appear. Now view the product table page. You’ll see the subscription information listed in the ‘Price’ column. The plugin has replaced the text in the add to cart button with the wording that you chose on the WooCommerce Subscription plugin settings page. When a customer adds a subscription product to the cart, the recurring payment will be correctly passed through. The subscription information will appear in the cart, checkout and in order confirmation emails. Perfect! WooCommerce Subscriptions is fully compatible with WooCommerce Quick View Pro. As a result, you can use the two plugins together and let customers buy subscriptions from the quick view lightbox. The plugins work together with no special configuration. This means that you simply set them both up in the usual way, and the subscription options will automatically appear in the lightbox. Just make sure you enable the Add to Cart buttons on the quick view plugin settings page. WooCommerce Subscriptions and WooCommerce Product Table also work nicely with the official WooCommerce Memberships and Groups for WooCommerce plugins. Both of these WordPress memberships plugins let you restrict access to an exclusive members-only area on your website. They work in slightly different ways, so check out this comparison to help you choose. In a nutshell, both plugins work by creating a WooCommerce product for each type of membership that you wish to sell. For example, if you want to sell access to 3 different areas on your website, then you would create a membership product for each one and list them individually using WooCommerce Product Table. Customers can choose the membership options they require and add them all to the cart, directly from the product table view. Used without WooCommerce Subscriptions, WooCommerce memberships lets you take one-off payment for access to hidden content on your website. You can use it with the Subscriptions plugin to get ongoing revenue from your membership site, e.g. to take recurring annual subscription payments. This is obviously a better business model than one-off access! WooCommerce Product Table works perfectly with standard subscription products. It does not integrate with variable subscription products. If you’re selling variable subscriptions, then you can list these successfully in a product table without an add to cart column. Instead, install the WooCommerce Quick View Pro plugin and add a quick-view column to the product table. Customers can click on the button to select variations and buy variable subscriptions from the quick view lightbox. Set up the product as a ‘Variable product’, NOT a ‘Variable subscription’. Add your attributes and variations in the usual way. Install the Subscribe All the Things add-on for WooCommerce Subscriptions. This handy plugin lets you add subscriptions options to normal variable products, instead of having to use the ‘Variable subscriptions’ product type. Click the ‘Subscriptions’ tab near the bottom of the Product Data section. Set up your subscription options as required. You can also see the workaround in option in the second table on our subscriptions demo page. As you can see, WooCommerce Product Table is the perfect way to display your subscription products. Customers can quickly look through the list of subscription options and add their subscriptions straight to the cart. No need to visit the single product page!